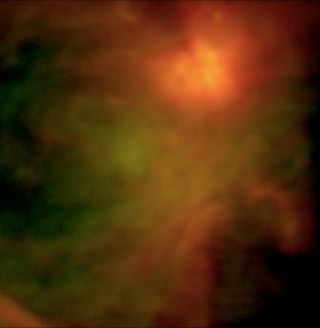 This infrared image of the heart of the Orion star-formation complex was taken from NASA's Stratospheric Observatory for Infrared Astronomy (SOFIA). This image, a two-filter false-color composite, reveals detailed structures in the clouds of star forming material, as well as heat radiating from a cluster of luminous newborn stars seen in the upper right. A jumbo jet outfitted with aninfrared telescope completedits first science flight Dec. 1, making formal observations of thecosmos fromhigh up in Earth's stratosphere. NASA's StratosphericObservatory for Infrared Astronomy, or SOFIA, took off froman Air Forcerunway in Palmdale, Calif., on Nov. 30. It flew for about 10 hours,capturingimages while in flight, before landing Wednesday morning, NASAofficials said. SOFIA should therefore allowscientists to better understanda wide range of astronomical phenomena, including how stars and planetsareborn, how organic substances form in interstellar space and how supermassiveblack holes evolve, researchers said. "These initial science flights mark asignificantmilestone in SOFIA?s development and ability to conduct peer-reviewedscienceobservations," Jon Morse, director of NASA's Astrophysics Division,saidin a statement. "We anticipate a number of important discoveries fromthisunique observatory, as well as extended investigations of discoveriesby otherspace telescopes." SOFIA is fitted with an airborneinfrared telescope 8.3 feet(2.5 meters) wide. The aircraft's instruments can analyze light from awiderange of celestial objects, including the warm interstellar gas anddust ofstar-forming regions, by observing wavelengths between 0.3 and 1,600microns,researchers said. A micron is one millionth of a meter.For comparison, thehuman eye can see electromagnetic radiation with wavelengths between0.4 and0.7 microns. The Nov. 30 flight marked the firstleg of SOFIA's earlyscience program. SOFIA used the Faint Object InfraRed Camera instrumenton thisflight, and will employ it on two upcoming jaunts as well, officialssaid. In February 2011, engineers willinstall another instrument,the German Receiver for Astronomy at Terahertz Frequencies (GREAT), ontheplane. SOFIA will then make three flights with the GREAT instrumentduring thesecond phase of its science program, according to officials. "The early science flight programserves to validateSOFIA's capabilities and demonstrate the observatory's ability to makeobservations not possible from Earth-based telescopes," said Bob Meyer,NASA's SOFIA program manager. "It also marks SOFIA's transition fromflyingtestbed to flying observatory, and it gives the internationalastronomicalresearch community a new, highly versatile platform for studying theuniverse." SOFIA is an internationalcollaboration between NASA and theGerman Aerospace Center, Deutsches Zentrum fur Luft undRaumfahrt.